With Palm Springs being a short trip from Las Vegas yet worlds apart in vibe and atmosphere, it’s an ideal vacation spot for Las Vegas residents. Those looking to plant roots in the area will be pleased to find plenty of luxury homes to make full or part-time residences. Berkshire Hathaway HomeServices California Properties The kitchen has been remodeled. Only 228 miles from Las Vegas lies an alternate desert oasis that has long functioned as Hollywood’s playground — a place for the who’s who to relax under the warm desert sun. 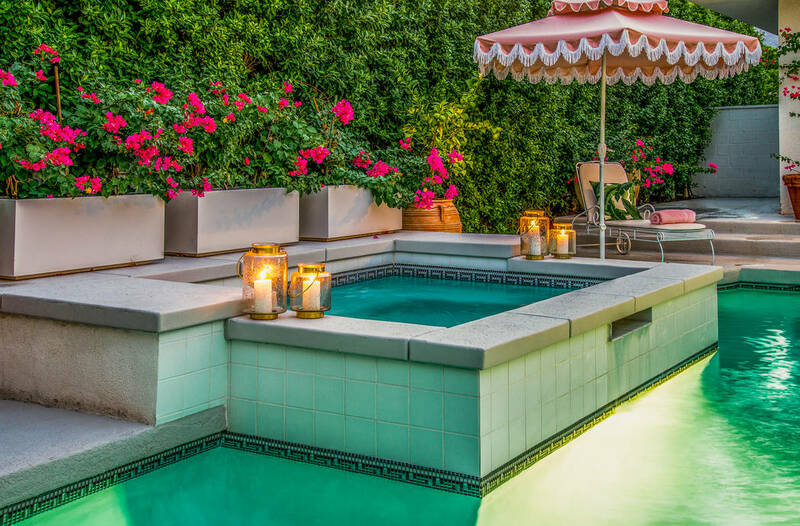 Palm Springs evokes a nostalgic feel with glimpses into Hollywood’s Golden Era while a reimagined downtown area features cutting-edge restaurants and a burgeoning nightlife scene. 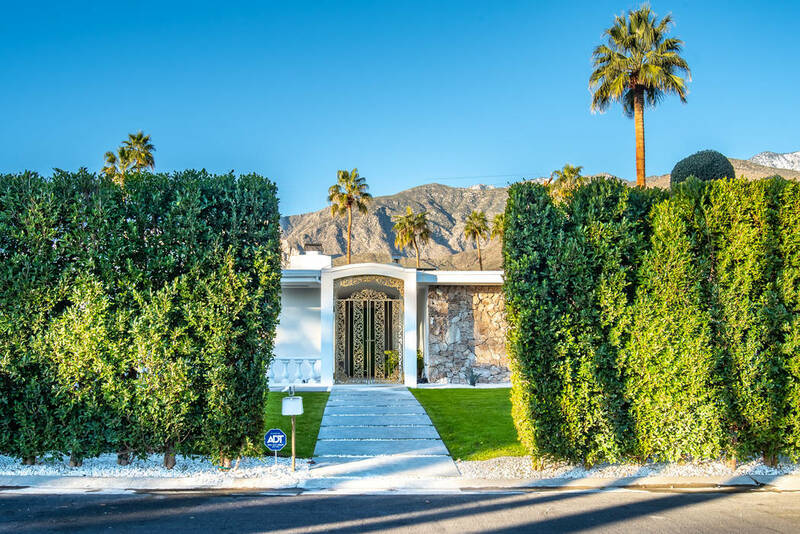 Thanks in part to its close proximity to ultra-trendy events including the upcoming Coachella Music Festival, Palm Springs remains a top city for the elite crowd to live, stay and play. Celebrities including Leonardo DiCaprio, Suzanne Somers and “EXTRA!’s” real estate and lifestyle correspondent Michael Corbett all have homes in the area. Longtime Las Vegas headliner Barry Manilow would even fly to his Palm Springs retreat after performances to escape the hustle and bustle of our 24-hour city. With Palm Springs being a short trip from Las Vegas yet worlds apart in vibe and atmosphere, it’s an ideal vacation spot for Las Vegas residents. Those looking to plant roots in the area will be pleased to find plenty of luxury homes to make full- or part-time residences. 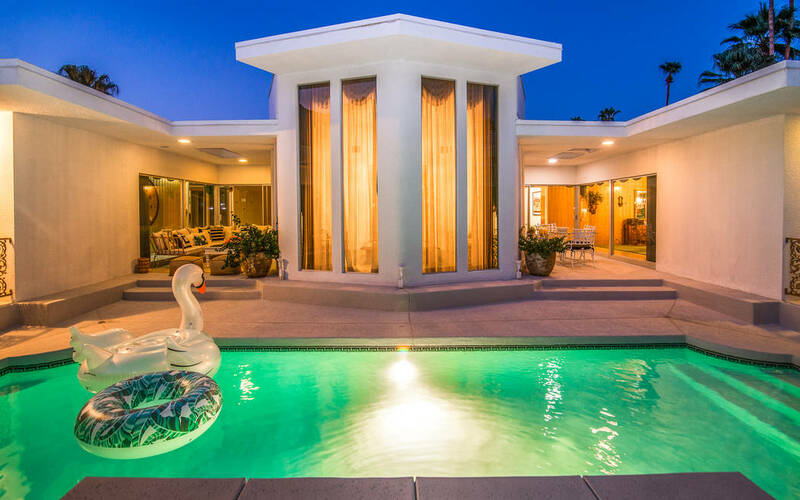 Nestled in the Twin Palms community is a one-of-a-kind home originally built in 1969 by a prominent, local builder as a custom dream home for his wife. “Since it was a labor of love, the dimensions and features of the home are ahead of their time including large living and dining rooms meant for entertaining, guest rooms with en suite baths and a spacious walk-in closet in the master bedroom,” Jervis said. “The estate has been impeccably maintained as a time capsule with an exterior that exhibits the best of midcentury modern architecture and an interior that was designed to transport anyone who enters its doors back in time.” The 3,400-square-foot estate located at 2055 Joshua Tree Place is available for $1.737 million and listed with Jervis. The impressive grand entryway complete with terrazzo floors leads into the living, or green room, adorned with vintage velvet wallpaper and floor-to-ceiling windows showcasing a sweeping mountain view. The den is warm and inviting with plush shag carpets, wood-paneled walls and a natural stone fireplace as well as a full tufted padded bar with matching stools. The space conjures images of late-night gatherings, cocktail parties and sharing stories with movers and shakers while listening to classic songs on the original jukebox. Each of the three bedrooms and baths tell its own elaborate color story. 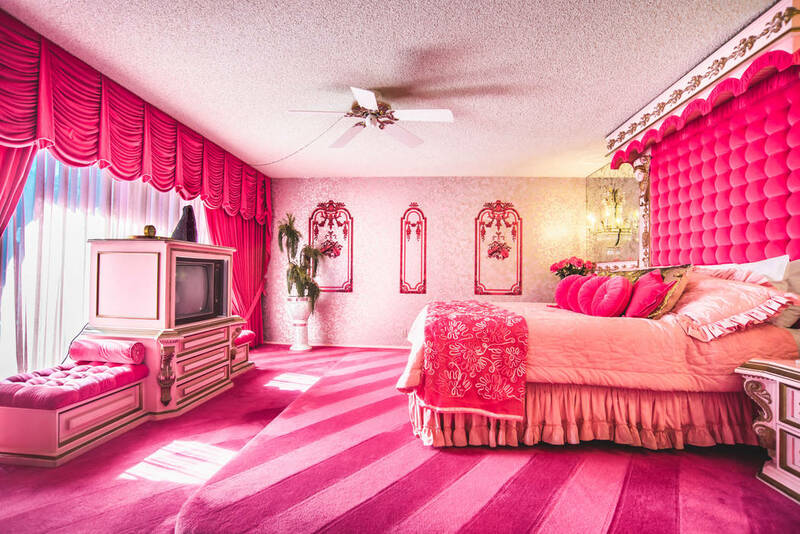 “The standout is the master bedroom or ‘pink room’ that was inspired by one of Elvis’ favorite colors,” Jervis said. Every inch of the space is immersed in complimentary pink hues as an homage to a simpler time. The quirky, yet luxurious décor has made the mansion a sought-after location for several fashion photo shoots. While the atmosphere elicits memories from the past, the house is equipped with modern conveniences. 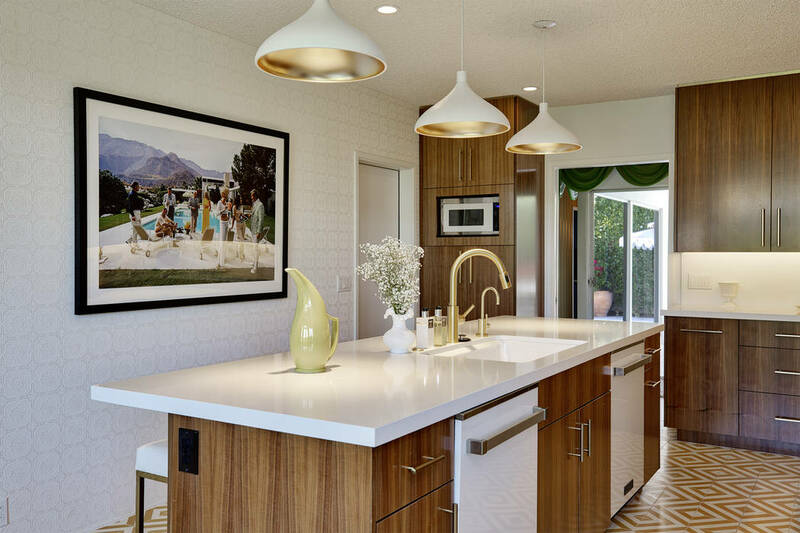 The kitchen and pool and spa area were recently remodeled in an episode of the Netflix home-renovation series, “Stay Here.” The kitchen now features exotic Moroccan-tiled flooring accented by Caesarstone countertops and is outfitted with state-of-the-art appliances. The pool area underwent cosmetic upgrades and was completed with upscale patio furniture. Mature fichus trees surround the home, providing privacy and a sense of being in a true desert refuge. From indoors to outdoors the home was made for entertaining. It exudes sophistication at every turn making it a true show-stopper that Las Vegans can appreciate.